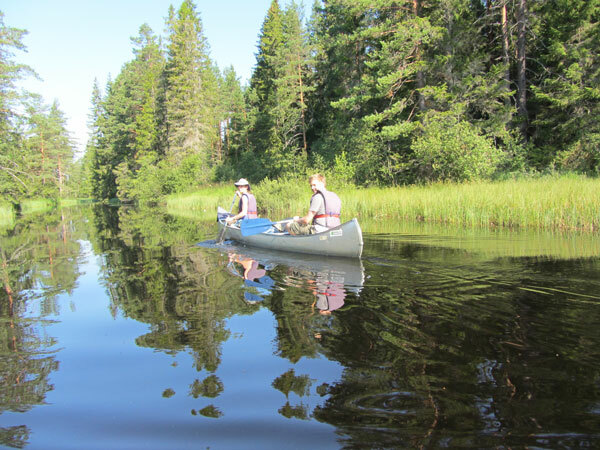 If your idea of getting away from it all is to immerse yourself in total wilderness for a few days, then look no further than a spot of self-guided Canoeing in Varmland, central Sweden. 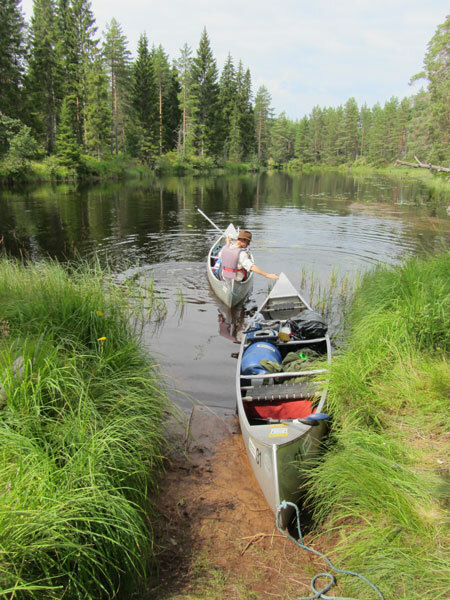 This summer I joined my husband and two adventurous teenage sons on a 4 day / 3 night canoeing safari on the Svartälven (Black river) in Varmland. We drove to Gunnerud from Stockholm in just over 5 hours and a short while later we left civilisation behind as we pushed off from the river bank in our two Canadian-style canoes. The Svartälven is a system of accessible and navigable rivers and passageways, interconnected with small lakes passing through an area of outstanding natural beauty. It was late in the day when we finally started paddling but in northern Europe in the summer it never really gets fully dark and we had plenty of time to find ourselves a suitable camp site. 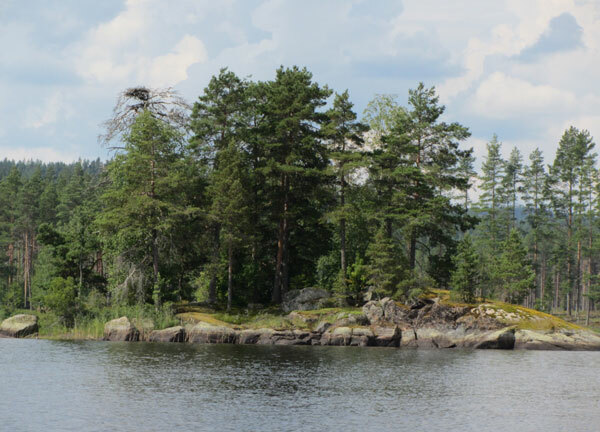 We were spoilt for choice but eventually selected a picturesque spot on a promontory at the side of the lake overlooking one of many little islands. We chose to have our trip provisioned as we were new to Sweden and didn’t want to waste time shopping for unfamiliar food, but you can of course bring your own tucker for the trip. We knew there was nowhere to stop and shop over the next few days during our canoe tour so we had to be totally self sufficient. We had plenty of food and all the relevant equipment for wild camping and cooking on stoves. 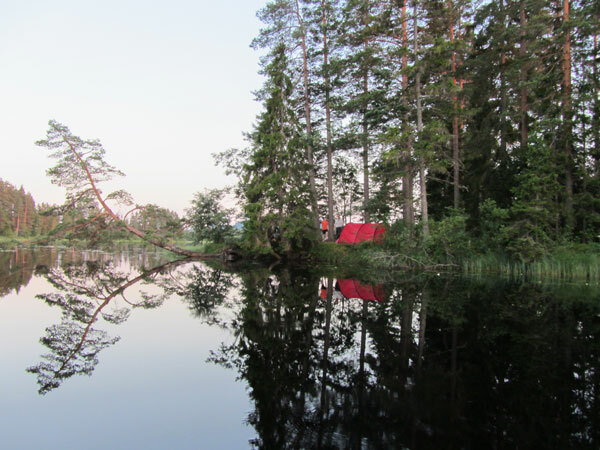 In Sweden as in other Nordic countries the public have access to the outdoors through the right to roam and freedom to camp anywhere they like for a couple of nights in the wilderness and there is certainly lots of opportunity and space to do this. Consequently we could camp or stop for lunch or a swim wherever we liked over the next few days as long as we met up at the prearranged pickup point at the end of the tour. Obviously this meant a certain amount of paddling a day to cover the distance but we found it wasn’t difficult and probably could have done substantially more than was required. We were provided with “portage” wheels for the short distances where it was necessary to go on land between river and lake but we only did this twice and it was no further than a few hundred metres at any point. The weather was definitely on our side with clear blue skies and sunshine most of the time and as we set our own pace we could glide peacefully through the beautiful forest settings. The reflections on the rivers and lakes were stunning and we were constantly aware of the insect and bird life around us. There were huge hawker like dragonflies zooming past as well as the more dainty demoiselles and brightly coloured damselflies darting amongst the lily pads and flowers. We were in sparrowhawk territory with the sometimes dense forest meeting the river or lakeside. We heard and saw many sparrowhawks but getting photographs as we paddled proved to be a challenge. We were being careful with most of our electronic equipment in dry bags most of the time which didn’t allow for much spontaneous photography. There was plenty of opportunity to explore the interconnected tributaries of the rivers and we were determined to see beavers while we were there. Evidence of their presence was everywhere with gnawed logs and “lodges” (collections of wood covering numerous underwater holes in the riverbank) interspersed freely along the river’s edge. 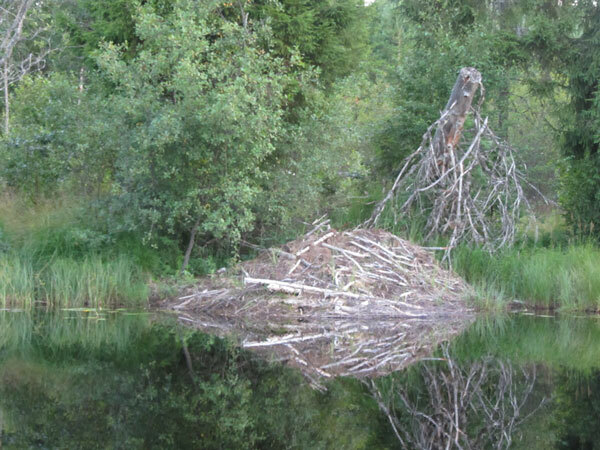 Our quiet patience was rewarded on one evening excursion up a tributary when we saw a beaver ahead of us with just its nose visible swimming from one side of the river to the other. As soon as it became aware of us it dived, slapping its tail to create a huge splash and disappearing from sight. We were lucky enough to see this behaviour three times that evening but were also bombarded with mosquitos so hurried back to camp and our welcoming fire to excitedly discuss our sightings and plans for the next day. Alas our adventure soon came to an end but we all felt that we had discovered a new aspect to the beautiful sights that Sweden can offer and felt determined to return once more to have another go, but for longer next time. 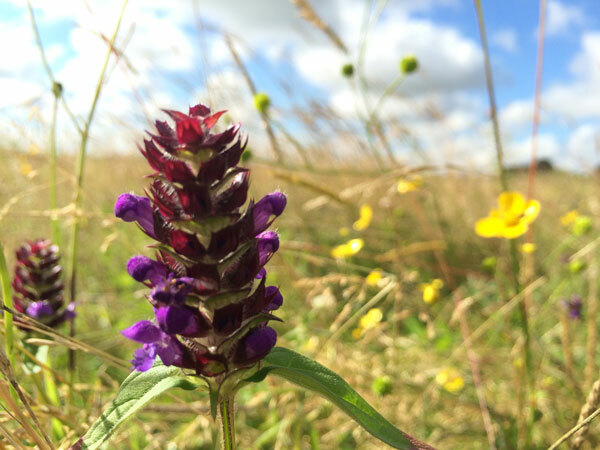 It’s astonishing how quickly wild flowers can take hold if they are given the right conditions to flourish. This is certainly true of the open pasture at Home Farm in Burkham near Alton, Hampshire. 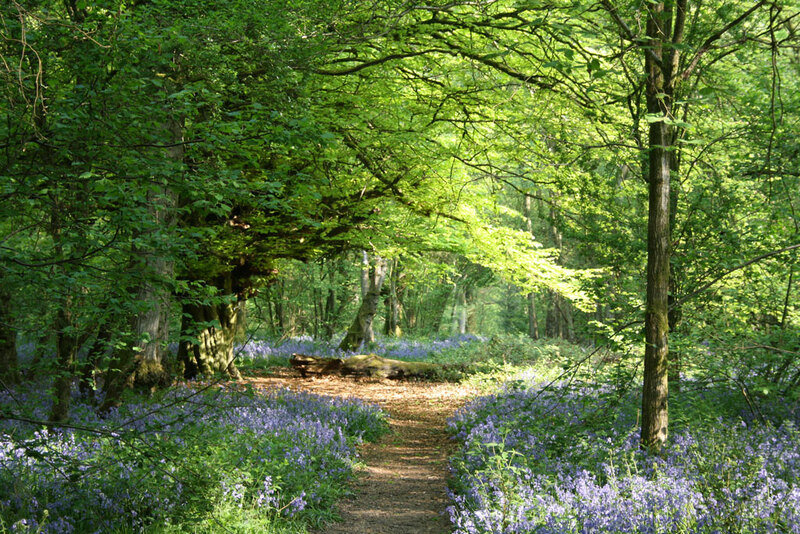 The 300 acre site was purchased by the Woodland Trust in the early 1990s and has since been planted with thousands of broad leaved trees such as oak, ash, beech, cherry and field maple interspersed with hedgerows and pastures. A large portion of the site was originally planned to become a domestic landfill site but with the help of a substantial donation from Lord Sainsbury, the Woodland Trust was able to purchase it and manage the land to the benefit of visitors, landscape and wildlife. 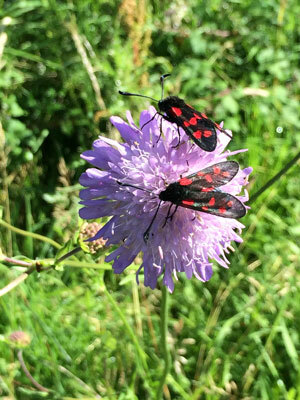 Now, more than twenty years since the Woodland Trust first took ownership and following their effective land management plan the site is full of life and a delight to visit. 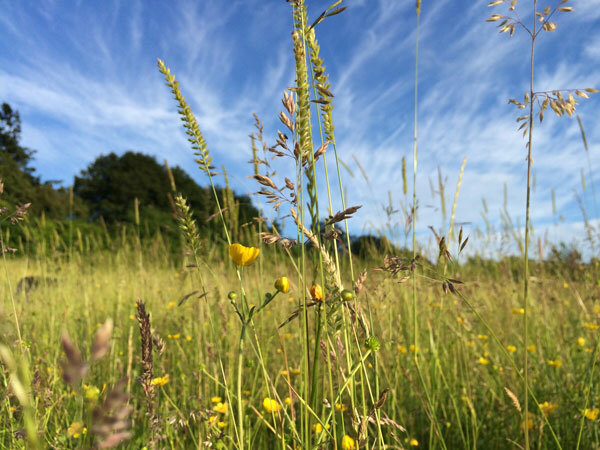 A walk following the mown paths across the meadow in June or July displays the beautiful diversity of grasses and wildflowers. Skylarks have taken hold in the meadow and along with the yellowhammers provide a constant soundtrack to a visit. 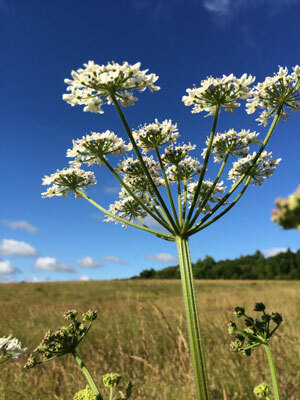 This morning I wanted to linger in my walk as there were butterflies everywhere, basking in the early sunshine. 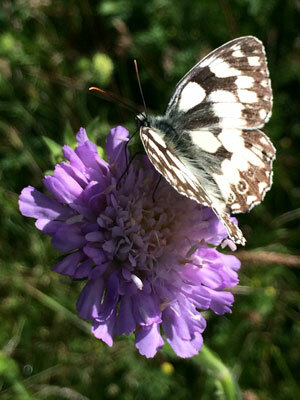 Marbled whites seem to do very well here and particularly favour the field scabious at the meadow edges. The Woodland Trust have done a fantastic job with Home Farm and should be commended on creating a beautiful place to visit as well as a developing habitat for a variety of wildlife.